For my STEP Signature Project, I travelled throughout North Queensland, Australia in May 2016 to study sustainable development and the relationship between human societies and the environment. My study abroad trip focused on The Wet Tropics World Heritage Area, the Great Barrier Reef, Aboriginal culture, the Outback, and the current states of the Australian environment and society. The majority of my time in Australia was spent exploring these environments with local experts and conducting field experiments. I experienced a change in my attitude towards being open to new experiences and meeting new people. When I have traveled in the past, I rarely sought out outdoor activities or planned trips to remote locations. I have always enjoyed being outdoors, but I don’t think I would’ve ever looked into finding hiking trails or going camping for a weekend before I went on this trip. As a result of this program, I have started valuing these types of experiences as much as I would value visiting cities. I also became more comfortable with conducting scientific research. As a political science and business major, I was nervous about the coursework. Though it was challenging at times, I enjoyed learning about things that I normally wouldn’t when on campus. I also became more comfortable with talking to new people. I do consider myself an extrovert, but I often found myself being more open with others than I would normally do so. Traveling abroad has allowed me to learn more about myself and gain a better understanding of the experiences that have influenced my personal beliefs and views. As for this study abroad experience, I really came to realize that lot of my personal values and goals are heavily influenced by the fact that I have grown up in the United States. I put a lot of value on pursing higher education and continuously staying busy with student organizations and internships so that I can be competitive job candidate. Ever since I was a child, I have planned to go straight to college after high school and then either join the workforce or go to graduate school after receiving a Bachelors degree. Before I went to Australia, I had always believed my plan to always be in school or working was the simply the result of personal motivations. However, when I was in Australia I realized that other cultures put more emphasis on things like travel and finding a balance between work and life. If I had grown up in another country, my personal values would probably be the same but my personal goals and plans would likely be different. The interactions I had and the relationships I built in Australia allowed me to gain a better understanding of my past experiences and myself. We were constantly with local guides and we also met a lot of European backpackers while traveling the country. We often discussed American stereotypes and what live in the US actually looks like compared to other parts of the world. I noticed that the lack of work life balance in the US is more evident than I had imagined. I came to appreciate other ways of thinking and question a lot of the ideas that have been with me my entire life. I really enjoyed talking to Americans who are living in Australia or New Zealand because I had great conversations with them about life outside of the US and they were able relate to my own experiences. The outdoor activities really led to the change in my openness to new experiences. Our first stop at Magnetic Island included a full day of intense hiking and it was one of my favorite days on the trip. When I was reflecting on this day, I realized that if I had been travelling on my own, I would have never considered spending a whole day hiking on an island. Another activity that led to the transformation was the time I spent camping at an old gold mine in the Australian Outback. Before this trip, I had only camped in my backyard. To my surprise, I loved camping in the Outback even though there were snakes, spiders, lots of dirt, and a rocky bed. A portion of my trip was spent with a homestay family, the Borgerts, on a farm. While I was with the Borgerts, I got to learn more about farm animals and the sustainability efforts. After staying on their farm, I realized that I wouldn’t mind doing farm work if I were to ever return to Australia on a working holiday visa. The experiments conducted on the trip helped me develop new skills and challenge myself academically. The first scientific experiment we conducted was on the Great Barrier Reef at Magnetic Island. We removed algae from corals because they were taking light from the Reef and then compared various methods to find the most effective one. This experiment was very straightforward and I was able to see the results of our work firsthand. The second experiment involved setting up areas and collecting fresh koala feces to estimate the koala population on Magnetic Island. The last experiment we did involved counting fish in different zones of the Great Barrier Reef. This experiment was much more challenging than the previous ones, but I felt like I had developed the skills needed to work on the report by this point in the trip. Why is the Transformation Significant? I think this transformation is especially valuable for my personal life and future goals, because it opened up my desire to travel abroad for longer periods of time and to look into taking a gap year after graduation or before graduate school to travel. I have always valued traveling, but I only made time for it if it involved schoolwork or an internship. I had heard of people taking gap years to travel, but that idea always seemed outrageous to me because I couldn’t imagine not working or studying for that long of a period of time. Before this trip, I had never met someone who went abroad to just travel for longer than summer break. When I was in Australia, I met a lot of backpackers who were traveling through the country and also locals who had been on extended trips to Europe. Through talking to these people, I realized that traveling for extended periods of time can be beneficial and the skills you develop can be useful in future careers. Going forward, I expect this change to influence my behavior because I will look for experiences that offer more than just tangible benefits and a way to better balance work with what I love doing in life. I also think I would be much more comfortable working abroad because of this experience. I have always wanted to work for an international organization or corporation, but I would’ve been much more hesitant to take on an international opportunity before I experienced this transformation. The coursework for this trip challenged me academically and forced me to go outside of my comfort zone. Some of the topics we focused on were related to my studies, but the majority involved environmental science and conduction experiences. I think this was extremely beneficial for me because I was able to use skills and think in ways that I normally don’t get to. I think this experience will be very beneficial in the future when I either enter the workforce or attend graduate school, because I will need to come up with new ideas and solutions to problems. My STEP Signature Project was a study abroad program in Paris conducted through International Studies Abroad. I spent 18 hours a week in classes where I learned more about France’s culture and language, and went home to a French-speaking host family. On the weekends and during breaks I was lucky enough to have the means to explore many cities around Western Europe (in and around France) as well as many museums, attractions and cultural experiences in Paris. My main goal when I departed on my journey (and indeed when I wrote my proposal) was to improve my fluency in French. That is fair enough for someone who wants to be a translator, and it’s fairly easy to say that it was a success. I feel much more confident now when reading, speaking and even listening to the language. But, without minimizing the accomplishment, this is something that is quite tangible that doesn’t really necessitate further reflection. I know that if I were to take the same test measuring my French level today as I did before I left, I would do considerably better. What I haven’t really had the chance to express are the ways that I’ve grown and the things I’ve learned about myself. A major difficulty was finding the courage to communicate in a language I was only somewhat comfortable using. Another challenge was adjusting quickly to being extremely independent; most of the exploring I did in France and around Europe was done on my own and with my own funds. I had to be careful with these resources and my personal safety, but brave enough to go out and find exactly what I wanted from my experiences. 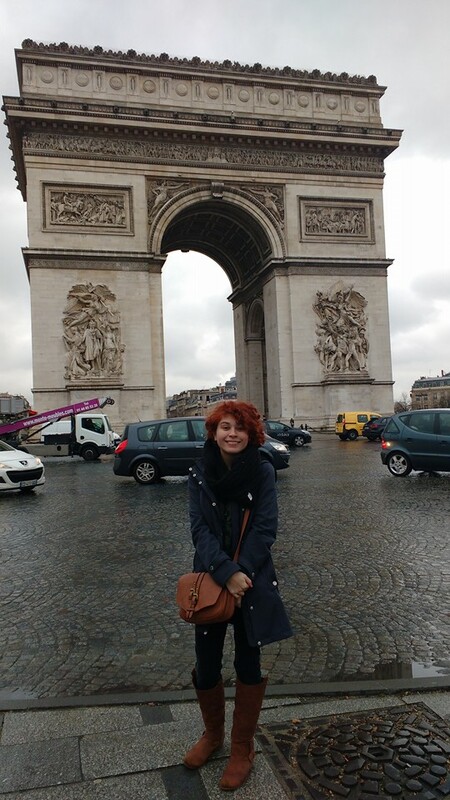 Me, in front of the Arc de Triomphe. Paris, France. One of the most vivid memories I have of being abroad was shortly after I arrived. I had found out the previous day that my phone from the US would not work there. Knowing I couldn’t function abroad without a phone (mostly for GPS reasons), I set out the next day to find a phone at FNAC, a French store similar to Best Buy. When I still had WiFi, I screenshotted the route I would take to get there on the Métro app, thinking that would be enough direction. However, the app had given me a very imprecise location, and I ended up lost in Paris, completely alone, for about an hour. I nervously asked for directions twice, and even then, I wandered a lot before finally finding the store. But that moment made me realize just how independent I would have to be while I was abroad. I couldn’t just rely on my phone – I had to be brave enough to ask questions in a language I wasn’t confident using. To venture out without a plan, and hope I’ll find my way. In fact, the best times I had while abroad were when I abandoned any overly detailed “plan” and followed my instincts and interests instead. Which brings me to my time in Venice and Bruges. 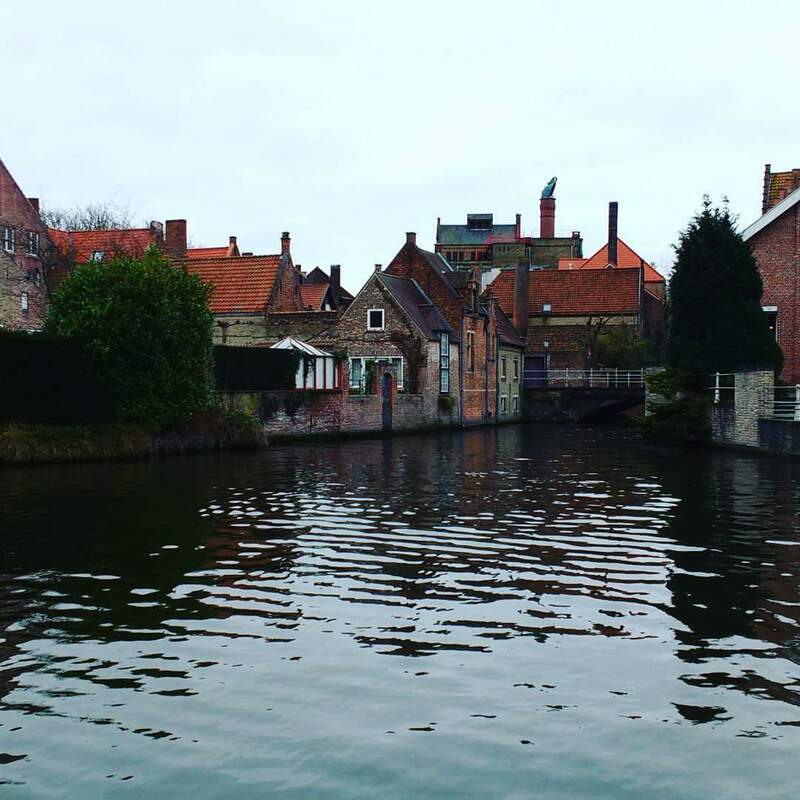 My Instagram shot of Bruges. As I said previously, I was lucky enough to explore 6 countries aside from France while abroad using (mostly) my own funds on weekends and during breaks. I worked long hours both during the school year and over the summer to accumulate enough money to do this, and even then I had to be pretty thrifty. Both of these trips were rather spontaneous plans from start to finish – I bought tickets less than a month before I left, and planned my activities the night before. Unlike in France, I was completely alone, I didn’t have full access to my phone’s GPS capabilities, and I had no real knowledge of the languages I was surrounded by. But armed with a semi-functional phone GPS, maps, and some confidence, I made my way through the cities without too much of a struggle. I already had a bit of experience in navigating Washington D.C. and New York City on my own, but I had never really deviated from my plan and just explored. That’s what I really got out of these weekend trips – the privilege of getting to know these cities and their history with no agenda other than my own. 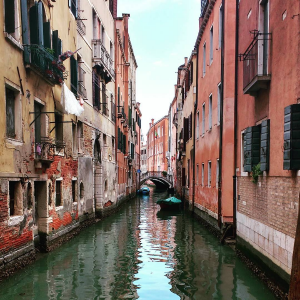 I wandered the streets of Venice for hours, just appreciating the canals, the bridges, and the colorful stucco houses. As soon as I arrived in Bruges, I wandered into a Picasso exhibit that I didn’t even know existed through my brief research of the city, and developed a new appreciation for the artist. Instead of being weighed down by the responsibility independence brings, I was liberated by the freedom it allows you. 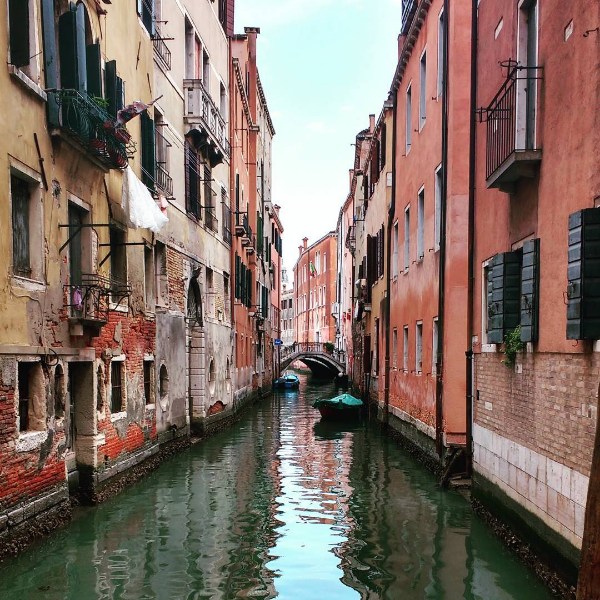 My Instagram shot of Venice. When I returned to France after these trips, which were about a month after the beginning of my time abroad, I feel like this independence made me much more brave. I was less afraid to make mistakes when talking to French speakers, which helped my learning of the language immensely. Before I left, I noticed my lack of confidence in comparison to the other students in my classes. Now I’m more sure of myself, and able to quickly talk around concepts I don’t have words for. The courage I learned will be applicable in a number of situations, but additionally, this confidence helped me to learn the language better, which was ultimately my reason for coming abroad! I think that learning these lessons about independence and bravery is such an important lesson to have learned before graduation. Being back in the states, I’ve noticed that I’m more willing to both take on chances and responsibilities, things I have been hesitant to do in the past. In the past, I had typed myself as introverted and stayed in that comfort zone, deciding everything outside of that comfort zone was impossible for me. Now, I can definitely see that I’m pushing myself to push the limits of that comfort zone – talk to new people and seize new opportunities. This program also made me realize that I would love to go back to France, to teach or for grad school (or both!). Perhaps not to Paris, as by my last month abroad, the city really began to overwhelm me. But I have fallen in love with the city of Rouen, and a grad program in Strasbourg. Hopefully I will fulfill my dreams of returning in the near future when I apply for the TAPIF program this year or next year. This past May, I participated in the Tropical Ecology Study Abroad in Panama. Here, other OSU students, our professor and myself, embarked on a two-week long adventure through the rainforests of Panama. We worked and lived under the Smithsonian Tropical Research Institute (STRI), completing our own research projects and exploring the country from coast to coast. This trip wasn’t just about the EEOB credit- it was so much more. We were completely immersed in culture and science alike, and I was opened up to an entirely new world I’d never seen before. I’ve travelled to France in the past and thought it was exotic in its own way. But stepping foot off of the plane in Panama, in a ninety-degree plus nightfall and immediately becoming sticky with moisture, told me that this trip would be much different. The climate was new, the fauna and flora were new, the culture was new, and my view on the world would soon be new. I realized that there is so much about a biological system that you just can’t learn from a textbook, or that a national geographic documentary doesn’t quite grasp a culture in the way that you can experience it. I even came to terms with the fact that rain is just rain, and if you’re going to get wet, you might as well embrace it. Before my study abroad experience, if you had asked me what an ocelot was or how big a Panama Tree can get, I would have had no idea what you were talking about. But this trip opened my eyes to an entirely new ecosystem, full of primates, toucans, mango trees, orchids and so much more. Most notably, we were introduced to the sloth. Yes, the sloth. I think the first time we all saw one was up in a canopy tower bird watching. From that point on there was a deep infatuation amongst our group for this kind-faced, slow-moving friend. In addition to the incredible animals we saw, there was one animal in particular that was fascinating, the homo sapien. Panama was filled with STRI researchers and guides who could tell us everything about the land and its history. We were led on incredible hikes through diverse terrain, which tested both our knowledge and our stamina. Guides would point out different species and explain their life histories and niches. When we went canoeing our guide explained that even here in the remote tropics, rivers were subject to pollution. This being something that we listened to in sadness as we floated surrounded by bottles and plastic bags. On Barro Colorado Island, scientists were on the brink of discovering many biological and geographical interactions of an isolated island system, one that had recently been formed because of the creation of the Panama Canal. Some of the local Gamboa STRI researchers even showed us how to go mist netting for studying bats! These people had come from all over the world to perform research in Panama and formed a community of their own. It was quite inspiring and helped us all understand the lifestyle of a biologist, as many of us had been considering such a career. As undergraduates in EEOB, we were all quite excited to do our own research. A pre-requisite for the course was Ecology, and in this class we had all done research on the squirrels of OSU’s campus. Now we would get to do our own research in the rainforest, on whatever we liked. My group chose to study the relationship between tree distance from the forest edge and the foraging habits of tropical birds. Whenever we had free time back at the schoolhouse, we would take our rain jackets, journals, and binoculars and head out to our chosen mango trees. There, we would observe. We used our knowledge of the scientific method and our professor’s guidance to delve into the world of the STRI researchers, temporarily becoming STRI researchers ourselves. We were often caught in the afternoon downpours, but eventually accepted the fact of being wet and often chose embrace it, as we would have to if we were true researchers. After all, we were in the rainforest, and its beauty made up for its actions. In Panama, we didn’t stay in some fancy hotel in Panama City; we lived in the STRI schoolhouse in the small village of Gamboa. We saw more agoutis than people and heard more howler monkeys than cars. But in comparison, we lived in luxury. We had air conditioning, a cook, and a bus driver that would pick us up and take us places. We had specialized clothes that would protect us from the bugs while keeping us cool. On the day that we visited an Embera Village, we took a bus, a taxi truck, and then a canoe to get to their remote home. Both men and women wore no clothes except for loincloths and they lived in huts, stacked on stilts to protect their homes from river floods. There was no running water and no grocery store, but our visit was incredible nonetheless. They fed us delicious fresh fruits and fish, both of which they had harvested. We danced, we swam in the river with the children, they painted our bodies with a special fruit dye, and explained to us how different nearby plants could be used for curing sicknesses and aiding in everyday life. It seemed as though everything that we’d all grown up with in the U.S. was excess. The Embera people were experiencing life in its truest form and were thriving in their own ways. This experience also made me very grateful for the life that I lead. I’ve been given incredible opportunities, like attending college and travelling to foreign places. None of which would have been easily been done given an Embera lifestyle. I came to respect a culture much different from my own and in addition was able to recognize the beauty of my own country. Travelling to Panama was incredible and these are just a fraction of my experiences. But they all did something very important. They showed me what was like to a) follow a research career, and b) follow said career far from home. I’ve been thinking about graduate school in the biological or conservation sciences, but wasn’t quite sure if I could handle or if I would like doing research 24/7. Not to mention that Ohio doesn’t boast much biodiversity, so chances are a career in science would lead me far away from home. But Panama showed me that if I choose, I could. It showed me that I would lead a life of learning and that being surrounded by people who share such a passion for the same interests is like being at home, no matter where you are. Panama showed me that there is so much more for this world to offer, and that for me, this is just the beginning of my love of travel and science. 1. My STEP Signature Project was a study abroad trip to Toledo, Spain for six weeks this summer. During this time, I was fully immersed in the Spanish language and culture, and took two Spanish courses that counted towards my minor at Ohio State. 2. Although it was one of the best experiences of my life, the program was also very challenging, and through it I found that my understanding of myself had changed. Before going to Spain, I did not think that I was capable of holding an extensive conversation with a native Spanish speaker, or being able to easily understand the Spanish accent. But I proved myself wrong on both these counts, and although my Spanish is far from perfect, it definitely improved and so did my confidence. I also gained a new empathy for people who are learning to speak English as a second language. I feel that Americans are often frustrated when people do not speak perfect English, but it is incredibly difficult to learn a new language (especially one like English that has so many strange rules), and I applaud them for putting in the effort to do so. My assumption of Spanish culture was also transformed this summer. Before leaving the U.S. I only knew a little bit about the culture, and most of this knowledge was centered around food, not customs or attitudes. I had not expected the people to be so friendly and excited that we were here, because I often thought that Europeans thought Americans were obnoxious. However, in this case I was proven wrong, as many Spaniards were interested in talking about us and hearing about our lives in the United States. I was surprised by how much they knew about American television, movies, and politics, and how often I heard American music on the radio. But of course they had their own unique culture as well, and I was able to experience traditions like flamenco dancing as well as eat tasty local dishes that were specific to certain regions in Spain. I also had no idea that Spain was so diverse in terms of landscape. For being a country about the size of Texas, it was incredible that one weekend you could go north and see forests, the next you could go south and see the desert, and the next you could go to the warm, sandy beach. 3. One of the experiences that transformed my confidence when speaking with native Spanish speakers was a language exchange program that was offered at my school in Toledo. Twice a week, my friends from school (who were also American), and I would meet two sisters named María and Mamen for coffee or dinner and conversation. They were natives of Toledo and wanted to learn English, so we would speak Spanish for half of the time and English for the other half. This challenged me to practice my spontaneous conversation skills in Spanish, and allowed me to further empathize with them when they struggled to find a certain word or phrase in English that they were looking for. My friends from school that I went with were also very encouraging and supportive when I struggled to find words in Spanish, and although we were all at different skill levels, we never judged or made fun of each other for struggling to speak. The program coordinators at the school were also amazing, and were very understanding of the fact that we were not native speakers, but also never let us speak to them in English, which forced me to practice more Spanish and figure out creative ways to get my points across. Another great experience that I had working with Spanish people was volunteering at the local library. One of my friends from my school was doing an internship at the library and teaching ESL classes to elementary-aged children and young adults. Twice a week I went to the library before class to help her with her younger group. The kids were so fun to work with, and their dedication to learn English (and in some cases German and French as well), further inspired me to keep up with my Spanish studies. They made me realize that Spanish children are very similar to American children, and that the desire to learn is universal. Traveling throughout Spain was one of the best parts about the program. Throughout my six weeks in Spain I went to Toledo (where I “lived” and went to school), Madrid, Córdoba, Granada, Segovia, Zamora, Valencia, and Barcelona. It was incredible to not only see the changes in landscape, but the influences of other cultures on the different regions. For example, I had not realized prior to this summer that Spain was under Arabic control in the early years of its history, from about the early 700s until 1492. That was another thing that amazed me about Spain; the fact that their history was so extensive, and that many historical buildings are still standing today. For example, in Granada, the Arabic palace La Alhambra has been beautifully preserved and is able to be visited, even though it was built around AD 889. My group and I went on a tour of it and it was breathtaking. The Arabic language and food are still present in the southern region, and it was an awesome experience to see how it blended with Spanish culture. In Toledo there are influences in the architecture from the Muslims, Christians, and Jews who lived there, which speak to the city’s unique history and the struggle for its control. The region of Catalonia, where Barcelona is located, has its own distinct culture as well, and even its own language of Catalan. It was the only time in Spain that I felt what it was like to read a sign outside of a store and have no idea what it meant, because it was in Catalan. Through these experiences I was able to broaden my view of what Spanish culture was, and appreciate the mix of different influences throughout the country, as well as learn more about the country’s extensive history. 4. This trip led to many areas of personal, academic, and professional growth, and was an extremely significant experience. It was personally challenging not only because I was submerged in a foreign culture and language, but also because it was my first time flying and travelling extensively without my family. At first it was challenging, but I had great support from the staff at my school and friends that I made there. Together my friends and I learned how to navigate Spanish public transportation, language barriers, and making travel plans. I now feel that I am much more capable to travel and plan trips on my own, and that is a great feeling. Academically, I improved greatly on my ability to comprehend when native speakers are talking to me, as well as my ability to converse with them. My classes were challenging but ultimately rewarding for my academic growth. In the future I plan to be a social worker, and I am sure that I will work with clients who are native Spanish speakers and know limited English. The skills that I gained through my STEP experience will help me to communicate with these clients in a way that they understand, which will ultimately benefit them much more and make them feel more comfortable working with me. I am excited at the prospect of using Spanish in my future career, and am extremely grateful for this opportunity through STEP that was able to help me grow and transform in so many areas. My STEP Signature project provided me the opportunity to participate in the British Invasion study abroad program in London and Liverpool through Ohio State. After spending two weeks on campus doing intensive course work, our study abroad group traveled overseas to discuss and learn about the influence of American music on British rock bands such as the Beatles and the Rolling Stones, and later their influence on American music today. Completing my STEP signature project has changed my views permanently on my assumptions of music, the world and most importantly myself. Before starting this musicology course, I generally knew the Beatles through their music and impact of the world but in no way was I able to name important turning points in their career or really all four of the band mates at the time! I knew that the Beatles and the Rolling Stones were huge successful bands, but I didn’t know why or the journey they traveled to get there. Having the ability to take the British Invasion course really changed my assumptions about the impact that British rock bands had on current music today. I was blown away of how American Motown influenced Britain so much that it was taken and converted back to significant influence on contemporary American pop music! Studying abroad in various cities in England was also an incredible opportunity to shape my view of the world. I had studied abroad when I was younger through a satellite programed called People to People, but being able to study abroad ten years later again with the knowledge I know about the world today was a life changing experience. What I also really appreciated was the ability to move around and see different areas of England. When I had traveled, I only saw London so it was so cool to see the differences in people between different cities. The culture of both London and Liverpool was so similar and so different in many aspects that it benefited to my development of a student, and world citizen. From this experience also, I learned a lot about my adaptability from traveling to different cities. I am a frequent traveler, but even being abroad and doing things on my own as oppose to relying on a group leader was such a liberating experience as well. During my STEP signature project, my study abroad group was able to do many unique activities and meet so many people that influenced the course work and career path I desire when I will leave Ohio State. While on campus before our travels abroad, our class had a guest lecturer come to give us a presentation about audio recording during the time of the 1960s. Mark Rubenstein is the Audio Engineer for the School of Music at Ohio State and was able to give my class a tour of his recording studio and test out equipment that was similar to the recording style of what the Beatle’s would have used. I had never had an interest in recording music nor knew anything about it, but I walked away from that lecture blown away by the knowledge Mark had about recording and a curiosity to desperately learn more. After class I remember immediately enrolling in his Audio Recording course for this current semester because I was so inspired by what I learned in that short hour. If my class didn’t have Mark come and present, I wouldn’t have known his class and this depth of audio recording equipment at Ohio State existed. While in London, our group got the opportunity to tour the Royal Albert Hall. The Royal Albert Hall is one of the most famous performing venues in the United Kingdom and has a long history of holding prestigious performers from all around the world. Getting the opportunity to take a tour backstage of the production of the venue and talking with the stage managers about the logistics of putting on a show was life changing for me because this is very similar to what type of career path I would want leaving Ohio State. Seeing the venue and talking with the staff about their position really solidified to me that this is the career that I would love to be apart of either in the United States or anywhere that the world may take me. One of the highlights that will always be a favorite memory of mine is getting to tour and meet the owner of the Cavern Club in Liverpool. The Cavern Club has a long history of being the first performing venue that the Beatles kick started their career. We were able to attend concerts throughout the day and talk with any of the staff and performers about what the music scene in Liverpool has affected them. Ohio State and the Cavern Club have a long history with this particular study abroad program of remaining close contacts throughout the years of sending students. The hospitality that Dave and everyone at the Cavern Club showed us was incredible and made me so proud to be a student at Ohio State. After graduation, I have a desire to work for a non-profit community art program and being able to see different areas of which I can accomplish my dream was such an inspiring and satisfying feeling while completing my STEP signature project. This opportunity has had significant value in my life as a student and as a young professional. Many experiences from this study abroad have shaped my decisions for looking at career paths in art administration and have shaped my educational interests by adding courses that have interests me throughout the trip. Before starting this project, I had an idea of what I wanted to do professionally but wasn’t really sure where to start or what direction to go in. After completing my STEP signature project, I feel more confident about the career path I have set for myself and excellent places to start that have the same transferable skills I’m looking for. After this STEP project, I also feel more connected to my love of music and performing arts with the opportunity to talk about the Beatles and also other major performing art topics while I was abroad. This was an incredible opportunity and I’m so thankful for the development I see in my future career plans, my educational growth, and the confidence in myself. For my STEP project I completed the Germany Global Projects program through Fisher’s Office of Global Business. The five-week program entailed working with a German consumer electronics retailer at their headquarters in Ingolstadt, Germany. This past summer, I was part of the Germany Global Projects program. This program was created through a partnership between the Fisher College of Business and the Ingolstadt School of Management. The city of Ingolstadt is just 30 kilometers north of Munich. The program involved being paired with a German company and working on a consulting team of three on a business project for five weeks. I was paired to work with Media-Saturn, a leading German consumer electronics retailer at their headquarters in Ingolstadt. At Media-Saturn, my team was placed within the company’s E-Business department. There I was responsible for researching the dimensions of technology along Media-Saturn’s customer journey and how technology pertains to the multichannel customer experience. The goal of the project was to determine how technology could be optimized in Media-Saturn’s multichannel customer experience. This project required me to map out Media-Saturn’s current customer journey and analyze it. In addition, my team was required to conduct field research that included visits to various Media-Saturn stores and competitor stores, as well as stores in different industries in Germany. From this field research I established detailed benchmarks of competitors as well as best practices of other industries. The culmination of the project included presenting my team’s research and my recommendations for optimizing technology usage in Media-Saturn stores in order to improve their multichannel customer experience. My experience in the Germany Global Projects program allowed me to challenge myself in terms of learning how to be a business professional and development of skills that included intercultural communication and ability to work effectively in a team. This project also exposed me to the working environment of another country. I was able to see first-hand how a company—or more specifically how a department of a company—operated day-to-day. Also during this five-week period, I was able to foster great working relationships and friendships with the two other Fisher students that were on my team as well as other members of the company’s E-Business department. In addition to working abroad, I was also immersed in everyday German life and culture. For five-weeks I had the opportunity to live in a brand new city. While in Ingolstadt, I stayed in a hotel with five other Fisher students. We were given passes to use the city’s public transportation and I was able to explore a lot of the city while I was there. Ingolstadt is home to the headquarters of Audi, subsequently a major employer for Ingolstadt, and during our first weekend there we were able to go on a tour of their headquarters as well as one of their manufacturing plants. In addition to that, on one of our first nights in Ingolstadt we went to a huge city festival. We got to try a lot of typical southern German food, ride carnival rides, and dance in a huge beer hall. Going to this festival was a perfect way to be introduced to German culture, more specifically Bavarian culture, and it was one of my favorite nights of the whole program. While in Ingolstadt we were also paired with German students at the Ingolstadt School of Management. We were able to visit their campus often and get a taste of what university life is like in Germany. In addition to experiencing Ingolstadt, I was able to travel on the weekends to cities nearby such as Munich, Nuremberg and also Dresden, Berlin, Vienna, Innsbruck and Salzburg. elop my cross-cultural communication skills in both English and German and provided me a meaningful experience that aligned perfectly with my two fields of study, international business and German. This program not only allowed me to gain work experience, but it also allowed me to meet new people and forced me to get out of my comfort zone. I was able to develop my teamwork skills, communication skills, as well as my intercultural communication skills by learning to work in an international setting with a team. Participating in this program helped me grow as an individual by having to live abroad in a different country. By living and working in another country I was forced to be independent and had to learn to adapt to a new culture and environment. Being a business major and having the opportunity to work with a leading international company at their headquarters was a unique and unforgettable experience that has contributed greatly to my understanding of the German working environment and conducting business in an international setting. For my STEP signature project, I chose to participate in a study abroad. 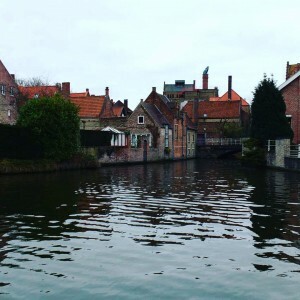 Last May, I traveled to 5 different countries in Europe as part of the Ohio State History Department program, Europe and the Second World War study abroad. I spent 4 weeks touring Europe learning about life and times during the largest war in history. My travels took me to Dublin, Ireland, London, England, Normandy, France, Paris, France, Krakow, Poland, and Berlin, Germany. This trip changed more about myself and my views than I could have ever imagined. I gained a large amount of perspective and widened my ideals significantly. I had never traveled to another developed nation before and therefore had no idea what to expect. I have spent my entire life growing up with the American view and had never learned much about the culture of Europe. I traveled to cities much larger (and smaller) than the ones I have grown up in and my ideals and cultural knowledge expanded massively. I also gained a sense of self capability and independence. I had many times in which I was forced to rely solely on my abilities to either find places or communicate with people who were not native English speakers. I became very aware at just how possible it is to communicate without words but rather through gestures and body language. I gained a sense of self and independence I have never had before. For the first time in my life I was completely responsible for making my adventures worthwhile and I succeeded! I learned that I don’t need to rely on anyone but myself and a map to get me to where I need to be. I was forced out of my comfort zone almost immediately. This showed me just how small my comfort zone was and how much I loved breaking out of it. There was not a single experience I remember saying no to and by pushing myself outside of my cultural, social and personal norms I discovered some truly great people, places and eats. I have found a new respect for myself as I traveled. Reflecting on the places I have been gave me a particular insight into my own beliefs and morals. By seeing places in which such terrible crimes have occurred I was forced to look inside myself and think about what I would do had I been in that situation, not only in the past but in my present. I learned more about myself then I had ever expected to. My tour began in Ireland, and thankfully my first two countries were English speaking so I could grasp the cultural changes. My comfort zone wasn’t really pushed until my first day riding the tube. Let me tell you the Londoners do not mess around when it comes to squeezing on there. After London we headed to Bayeux, France. This was one of the most beautiful cities I have ever been to. The people were wonderful and the town was out of a movie. This is when my cultural and personal beliefs began to shift. We spent around 5 days learning about and traveling to the beaches that were instrumental in winning the Second World War. Here on these beaches, people were enjoying their days, lunches, lives, where as just 70 years before thousands of young men lost their lives. This was one of the harest facts to take in. Many of the men who lost their lives were around my age, 20, when they were drafted. Being in this place gave me the chance to really see what they were up against. The beaches were much larger than I had pictured and the German strongpoints looked unbeatable. We also visited the German, British, and American cemetaries giving an incredible, tangible feel for just how many people had lost their lives. I was now beginning to grasp just how many people had sacrificed their lives. But I was incredibly naïve. Once we arrived in Poland I thought I had a handle on the statistics and activities. I found myself capable of navigating and doing and seeing everything possible. I had begun to understand how to communicate with my hands and knew how to order and find good places to eat. Then we went to Auschwitz. Krakow is a small, picturesque town filled with incredible people. The street food is to die for and the buildings are beautiful. Krakow was one of the happiest places I had been, but just about an hour away was one of the most devastating, fatal sites of hundreds of thousands of murders, Auschwitz-Birkenau. The day we spent in Auschwitz forever changed my life. This camp remains exactly as it was in 1945 when it was liberated by the Allies. It genuinely surprised me how close the surrounding town seemed to be to such a significant sight. We entered the camp through gates inscribed “Arbeit Macht Frei” or work will set you free. This gate, for so many people, was the difference between life and death. Upon entering this gate there was no hope for escape. Being inside a place in which such devastating crimes occurred was overwhelming. Whilst listening to our tour guide it was almost impossible to believe a lot of what he was saying. Once we entered the buildings we were shown the remains of what the Germans had left behind in their haste to escape. This was the most tragic. Upon entering the first building, 2 tons of human hair had been preserved. The Germans had left almost 7 tons in their retreat. The 2 tons filled a room larger than the entire first floor of my home. This was unbelievable to me. The excessive greed and complete dehumanization of these innocent people was truly shown in this room. This completely changed my perspective. I had never seen anything like this before and it devastated me. In this place I realized just how many people had lost their lives and just how much humanity had been lost. Being in such a significant place gave me a new more personal connection to something I hadn’t been able to fully understand without seeing. Our tour guide also provided us with personal accounts and stories about the prisoners which helped increase my understanding as I was standing in the same place. By the end of my visit to Auschwitz I had been an entire new appreciation, respect and general heartbreak for the victims of such treacherous crimes. It made me thankful to know that Poland would never let what happened to the people of their country, and those of so many others be forgotten. My STEP experience provided me with an incredible appreciation for the history of the war. Although I have always been interested in World War II this trip provided me with an understanding unmatched by learning from a textbook. Not only did I grow as a person, but I grew as a student, historian, and leader. I gained some of the greatest friends I could’ve asked for and had the time of my life. With a deep understanding I came to realize how powerful just one person can be and how silence can be as destructive as action. Personally this trip gave me a strong desire to continue traveling and professionally it gave me the hope of eventually working abroad one day. My trip showed me the importance of life, acceptance, and above all standing up for what you believe in. I gained a self-confidence and independence that I could not have earned in any other place. My STEP project consisted of traveling to London, England with the Knowlton School of Architecture over spring break in March, 2016. During this trip I visited important sites including Stonehenge, St. Paul’s Cathedral, Salisbury Cathedral, and Herrods and had immersive cultural experiences including but not limited to a full British tea, a Covent Garden street show, and a visit to the National Gallery. I blogged while on the trip, and after returning home, I worked in the context of my architecture class to report back through an interactive presentation which combined sketching and poetry. My study abroad experience helped me to build meaningful relationships, gain confidence and independence, and begin to understand that the world is both larger and smaller than I ever could have imagined previously. This trip gave me the opportunity to build friendships with a current friend and new friends, alike. As an only child, I have grown up to be a very introverted person who is often uncomfortable putting herself out there for fear of being rejected. More often at home in my own company, by placing myself in a context where I saw the same people every day, many of whom I didn’t know previously, the trip forced me to face my fear and become more self-assured. Another goal in taking this trip was to become more independent, something I managed to achieve by being forced to navigate for myself, make sure I was eating and resting enough, and generally make my own decisions in a foreign environment. Finally, this trip awakened to both the surprising similarities between home and London and the profound differences between the two. Realizing both of these things has given me a better sense of self as an American, because I feel I have a better context within which to view my home country. Almost blowing up in the Oxfam charity shop in Salisbury was a turning point in learning to be a better friend. I had the fortune of being able to take this trip with one of my best friends. She studies city planning, so the trip was a natural fit for her. The thing about traveling with a friend is that you not only see each other at your best, when you want to be seen, you also see each other while brushing your teeth, while sleep-deprived and running on pure caffeine, while crabby because you didn’t have time to eat breakfast—the times when you’d rather be alone. Due to a faulty ATM deal, my friend lost a good chunk of her spending money for the trip. I was happy to cover her lunch cost as she tried to contact her family for more money, but when she asked if I could cover her dinner as well in the quaint, Salisbury shop mentioned above, I started to boil over. I was running out of money a bit quicker than I would have liked and, in her happy-go-lucky manner, she announced that she had not yet tried to contact her family. I begrudgingly agreed to pay for her. Later that night we had a talk. She had spoken with her mom and would be getting more money. I confessed to being upset she didn’t make more of a plan and she confessed to feeling upset over my unwillingness to help. We patched things up. Though it isn’t one of the happier memories of my trip, it is one of the most valuable. I tend to never fight with my friends, because I am afraid our relationship is so fragile, it will collapse at the slightest upheaval, but I learned that a good friend is someone who will help you out in the bad, and, even when you fight, cares enough to talk things out and make up. Besides learning to be a better friend to a friend I already had, I also learned better how to get to know people I didn’t already know. I always tend to wait for others to extend the hand of friendship to me, because it is a surefire way for me to know they like me. Though I was nervous about taking this trip with a group of students I didn’t know who are in a vastly different major than me, I actually think the strangeness of the environment gave me enough anonymity to be more fearless about reaching out. I would confidently ask if I could join in on others’ dinner plans, and I even initiated some plans of my own within the group. It may sound silly, but I was genuinely surprised (In a good way!) when these people I was just getting to know enthusiastically agreed to have me join them. On one particularly lovely evening in the neighborhood of Greenwich, while dining on seafood at one of Jamie Oliver’s restaurants, laughing and talking with a group from the trip, I realized that so much of my lack of confidence as a friend and friend-maker had come purely from my own insecurities. I realized that most people value my presence and input. I don’t think I would have come to these realizations in my everyday environment around my everyday people. I think it took a foreign experience and a group of regular strangers to show me I am more capable than I thought I was. In the same way that going to London with a group of strangers raised the stakes, enabling me to better make friends, going overseas for the first time also forced me to become more independent. I had travelled alone before in California, but I knew this would be a new challenge. When I lived in the dorms my freshman and sophomore years, I had to take care of myself, but, at the end of the day, my parents were always down the street, able to bring me food or console me or let me spend the night at home if I was stressed out or upset. I moved back in with them at the start of my junior year and quickly fell back into the pattern of letting them do most things for me—cook, grocery shop, even do my laundry. While I feel very fortunate to have parents who are willing to do these things for me, I definitely saw the need to be able to take care of myself when they weren’t around. London was perfect for this. My program directors, Aimee Moore and Troy Malmstrom, trusted us with a large amount of choice and free time which bred decision making. I made sure to eat a large and nutritious breakfast every morning since we did a ton of walking on the trip. I mastered London’s complex Underground and was even able to navigate it for myself and others by the end of the trip. I was also in charge of my own money. I had to make sure I wasn’t spending so much on souvenirs that I didn’t have enough to left eat and travel. When I realized halfway through that I was a little under budget, I managed to stay disciplined and lay off the spending until I knew I wasn’t going to run out of money. I proved to myself that I could live in another country and have a good time without going broke. Even though these tasks are simple—feeding myself, taking care of my money—the fact that I could accomplish them gave me a newfound sense of self-confidence that I will be okay when I eventually do move away from my parents and start fully taking responsibility for myself. On certain streets, in certain moments, London looks a lot like New York City. Public busses pause (or don’t!) for busy pedestrians with somewhere to be. There is a Starbucks on every other block. But then, with a second look, there is a blue plaque on the building next to the Starbucks which states it is the place where John Wesley founded Methodism or the former home of Rudyard Kipling. Before going to London, I thought I knew a lot about it. I grew up watching British comedy series on public television and have had a penchant for sad British pop music since high school. I thought I knew what to expect. This all would not have been worth mentioning if I wasn’t wrong about that. It may sound paradoxical to say that it was far more similar and far more different to America than I imagined it, but it’s true. It was similar in small but abundant ways—the prevalence of Starbucks and other cafe chains, the language, the sections of bars and shops where hip artistic people gather, the obsession with celebrities plastered on everything from busses to magazine covers. The shell on the outside of the culture is largely the same as ours. It was enough like home that I felt comfortable. It wasn’t totally foreign which allowed me to really pay attention to the differences. Here’s what surprised me—though we share a lot of pop culture and infrastructure with England, some social aspects of the culture are stupefyingly different. A perfect example of this difference is the way the British view art. They load every public space with it, something I’ve rarely seen in the United States. An exhibit on Paleolithic man at the Museum of London integrated contemporary poetry into the displays. The churches we visited, including St. Paul’s and Salisbury Cathedral featured high-concept art installations even inside. Covent Garden was filled with highly-talented artists performing out in the open, everything from a stilt-walker quoting Shakespeare to an opera singer performing for an outdoor cafe crowd. Art has a value in every aspect of English life which it doesn’t carry in the United States. Here, art has its place—the television or the theatre or the gallery—not the public sphere. The longer I was in England, the more I began to understand it as a very old country in comparison to the United States. I hypothesize that it is this much longer historical legacy causes the British to revere their art more. It has come farther and lasted a long time. Also, England is a much smaller country which means this large and rich history is more compacted into a city like London. This country had a way of making me feel at home enough to explore which led me to experiencing a culture which is truly much different than my own. This experience noting the similarities and differences between cultures helped me to better understand what it means to be American—we are in our adolescence, still finding ourselves as a country. The legacy of our art and history is still being formed day by day, the magma of it is still cooling and therefore still malleable. Poem written by me as part of my class reflection on the trip. It responds to the apocalyptic Brutalist architecture of the Barbican Centre. The confidence, independence, and cultural perspective I gained from this trip has made me a more balanced individual. As someone who is prone to fearing others’ opinions of her, being forced to extend myself amongst strangers and work through bumps in a previously existing friendship showed me that I am a better communicator and friend than I knew. In the months following this trip, I have been able to take greater initiative with old friends and new in making plans and deepening connections with minimal fear of rejection or lack of self-confidence. I have seen my friend group expanding as I continue to believe more and more than I am capable and worthy of that friendship. The confidence I gained in being able to take care of myself independently has served me very well when I went to England again a few months later in June. This time, I travelled alone in London multiple times, navigating the Underground all by myself. I got lost, but managed to find my way (as late as I was to my final destination). I even arranged my own travel from the hotel to Heathrow airport. I also managed my money without the slightest fear of running out. If I wouldn’t have gone to London in March, I shudder to think of how lost I would have gotten. I also shudder to think of how afraid I would have felt to get around by myself. Additionally, in my home life, going abroad has prepared me very well for my next endeavor—moving out of my parents’ home into my own place for the first time. The knowledge that I can take care of myself thousands of miles away from my parents has give me assurance that I will definitely be able to take care of myself across town from them. Being immersed in the culture of England has also given me greater insight into the fact that America is not the only country. To see how surprisingly different the American way of thinking is to even the British has opened my mind to the idea that there are as many ways of thinking as there are countries, if not more. Truly, this experience was one of blossoming. My interpersonal- and self-confidence blossomed out of necessity, and my mind was opened to the idea of new and different cultures existing. Finally, my creativity has blossomed as a result of this trip. Studying English, creative writing, and theatre means my future after college is a toss-up. I could go to grad school for an M.A. or an M.F.A. I could go into screenwriting or playwriting. I could find a way to use theatre or art to heal broken communities. All of these things are possibilities to me, and I have felt inspired in each of these areas because of this trip. Learning more about the rich literary history of the country sharpened my already keen interest toward British literature, and the foreign beauty which surrounded me has created a whole new body of experiences I can use in the future in my own writing. The value placed on art as a vital part of existence was, I am sure, a part of the thought process that has brought me to my latest project—creating a Shakespeare workshop for middle-school aged girls to learn confidence and positive interpersonal skills. To learn that the American art landscape is still in its adolescence compared to its British counterpart makes me feel hopeful that there is still room for my art, and that it could add something to my culture and those living in it. Friends, Flowers, and London! What could be better? I consider my trip to London, made possible by my STEP fellowship, to be one of the most influential weeks of my life, personally and artistically, an experience the ripples of which I will feel well into my future life. This past May, I embarked on a two-week study abroad trip through Ohio State’s Engineering and Culture in India program for my STEP experience. During our time in India, we visited cultural landmarks located in the “Golden Triangle” comprised of the northern Indian cities of Agra, Delhi, and Jaipur, in addition to completing a service project working with Barefoot College. Our group also had the opportunity to explore engineering undertakings in country, both in academic and real-world settings. My time in India was undoubtedly a transformational experience to say the least. Traveling halfway around the world into unknown territory is extraordinarily eye opening. The country of India has such a rich history and defined culture that is lacking in the US in comparison. Immersing myself in this unfamiliar environment and embracing the Indian lifestyle allowed me to gain an enhanced appreciation for diversity in the customs, traditions, and heritage of those surrounding me and approach life with an enriched global perspective and cultural sensitivity. Not only did this journey have a significant impact on expanding my view of the world, but it also gave me insight as to the future direction in which I want my academic degree to guide me. I was able to observe educational and industrial engineering projects in country and become technically aware of this field on a global scale. This educated me on the importance of adapting technical solutions to best serve the society in which they will be applied and confirmed my desire to become a materials science engineer with the ultimate aspiration of improving the quality of life for individuals in need. It is difficult to identify in which specific events my personal growth was rooted, as it was more of a collection of experiences that made my Indian summer unforgettably transformational. Visiting numerous World Heritage Sites such as Qutub Minar, the Agra Fort, Fatehpur Sikri, Jantar Mantar, and of course the Taj Mahal exposed me to the lavish history of India with evident royal influences and made me realize the brevity of the US backstory in comparison. Although these significant national monuments were magnificent, perhaps my favorite cultural experiences were the rickshaw rides through the historical cities of Agra and Delhi. These tours provided an unembellished, raw view of the authentic Indian lifestyle. Maneuvering through the infamous Indian traffic, walking into Jama Masjid mosques, and experiencing the strong smells of Indian spice markets and street food presented me with an honest experience in which I was fully engaged in their society. As a result, I feel as though this genuine portrayal of Indian lifestyle is what truly expanded my worldview and elevated my cultural understanding on a global scale. Furthermore, my time in India was tremendously enlightening from a spiritual learning perspective. I am not usually deeply connected with this side of myself, but visiting religious sites from five different denominations was didactically enriching. I had the opportunity to visit the Bahai Lotus Temple, various Jama Masjid mosques, a Sikh temple, a Jain Temple, and a Hindu Temple and was able to witness a form of religious practice at each of them. My most vivid memory was at the Akshardham Hindu Temple, where my group and I were invited to participate in a religious ceremony that was occurring. Despite the fact that it was clear that none of us were Hindu, I felt very welcomed into the Indian culture by partaking in this spiritual practice. Becoming familiar with the sacred beliefs from each of these religions and realizing the similarities in their moral values allowed me to gain insight on the ethical motives that guide these groups and understand their overall approach to leading a virtuous life. The popularity of yoga principles and ideology in India also aided in my spiritual and mental maturation that this study abroad experience fostered. I had the unique opportunity to practice yoga in its country of origin overlooking the Taj Mahal. This discipline promotes the unity and health of mind, body, and spirit and allowed for a period of deep reflection while in country. It was during this time that I perceived how sincerely grateful I was for this adventure and all that India had to offer from a cultural standpoint in addition to comprehending the importance of finding balance between working hard to be successful and enjoying the beauty of life around me. The engineering experiences I had while in India were remarkably inspiring. In particular, receiving a tour of the Jaipur Foot Hospital and fabrication facility and interfacing with Dr. Jain truly solidified my interest in biomaterials within the materials science and engineering field and escalated my desire to provide help to others through technical engineering advancements in the medical industry. It is amazing how the simple handmade Jaipur foot prosthetic device has permanently changed and improved the quality of life for thousands of Indian individuals by providing affordable treatment that adapts to their lifestyle and makes routinely activities possible again. This was previously unachieved by conventional prosthetics. My ultimate goal is to be a contributing member of these technological medical innovations that have a lasting positive impact and enhance living conditions for those with debilitating complications. The opportunity to volunteer at Barefoot College, an NGO with the primary focus of finding sustainable solutions for rural villages while empowering women from across the world by enabling them to provide for their impoverished communities, was wonderfully motivating. Meeting the individuals participating in the solar engineering training program, who were known as “Solar Mamas”, was entirely life changing. They were the definition of strong, independent women and their sheer courage and resilience was empowering and something that I will always remember as I progress in my studies and future career as an engineer. I will always cherish my Indian adventure and the lessons I have learned as a result of this journey. Inwardly reflecting, upon my departure, I will be concluding my STEP experience as a transformed well-rounded individual with a more cultivated understanding of our diverse world as a whole. Assimilating and immersing myself in the Indian culture has expanded by universal conscientiousness and heightened my societal, intellectual, and spiritual awareness. This will enable me to approach distinct situations with a strengthened open-mindedness that will allow me to comprehend and appreciate the unique perspective of others. Academically, I have gained an enhanced understanding of engineering from a global perspective, which I will be able to apply throughout the remainder of my academic career implement in my future career. An important piece of guidance I was given at Barefoot College was that it is impossible to go into that specific experience with a set service project idea and rigid plan without observing on-site how the program operated for several months prior. Only then would it be conceivable to analyze the situation and formulate a project that best suited the need of the organization. This advice is extremely valuable, as it is impractical to devise and provide an efficient engineering solution without fully considering all aspects of the problem. I will definitely implement this principle and incorporate it into my daily work as I am required to formulate these technical solutions upon entering industry. Dhanyavaad to the beautiful country of India for an unforgettable experience that broadened my global outlook, and to the best university for providing me with this opportunity of a lifetime and giving me an amazing group of Buckeyes to share this journey with. Go Bucks! I spent my summer in Moscow, the capital of the Russian Federation. Through STEP and OSU I was able to study the Russian language, culture, and political system by attending classes and living with a host family. I have always been a confident person; I can speak with anyone and I hold my own in difficult situations. The moment I got off of the plane in Moscow, though, I was a different person. I was timid, uneasy, and a little scared. But these were all good things. I was able to rebuild my confidence and create a home in a new country. I believe that I am now a more confident, capable, independent woman because of my study abroad experience. When I told people I was going to Russia for two months, the look of terror was the same on every face. People were afraid for me. They told me I was brave. What they did not understand was that Russia is a great place. Russia is full of music, art, culture, history, food, and learning. Yes, the country has some political problems, but what country doesn’t? I came to realize that people are people, no matter the hemisphere or time zone. Russians are friendly, hospitable, smart, creative, and funny. Every one of them exceeded my expectations. For two months, I lived with a woman named Marina (Марина). She is a hydrobiology professor at Moscow State University and has hosted American students for twenty years. She was the very first Russian I met and she pretty much held my hand for the summer. Marina is the most warm and caring person; she made me tea twice a day and never failed to ask me about class. She taught me what it means to be a modern Russian woman. My study abroad group went on excursions every Friday. We saw Moscow from a riverboat, from the sky at Ostaninko Tower, and from underground on our many metro rides. We experienced Leo Tolstoy’s house in Tula, an interpretation of Anna Karenina onstage, and Finding Dory in Russian. We visited the Tsereteli Sculpture Garden, the Ochakovo Beer factory, and one of Stalin’s underground bunkers. I quickly realized that Russia is full of fun and exciting activites. We studied at The International University of Moscow (МУМ). My class schedule contained grammar, pronunciation, conversation, history, geography, Internet, film, literature, and dance. The professors at МУМ are trained in teaching Russian to American students. With class sizes of three to five, we had real one-on-one time with these professionals. Their expertise helped my Russian language skills immensly. As a double major in Russian and International Security and Intelligence, studying abroad was necessary. I truly believe that the only way to keep our nation safe is to understand others. This summer gave me real insight into the minds of Russians. I know understand how they think and what is most important to them. They are people. This understanding is required in my field of study. Before this summer I had been out of the country only for a cruise. I had never seen something outside of American culture or had been around non-English speakers. My personal goal this summer was to see something, to do something. I saw the cliffs of a rural Russian island, Peterhof Palace, and Red Square. I rode a train from Moscow to Saint Petersburg like Anna Karenina, I navigated the metro like a Muscovite, and I took a nap in Gorky Park. My study abroad experience helped me achieve my dreams.